Her writing has become a central focus in her life. In her intensive periods of writing, she often works non-stop from early morning – for 16 hours, only interrupted a couple of times during the week for a quick trip to the grocery store for something to eat. She admits that the impact of these intensive weeks of writing is stronger now than before and that she gets more tired, but her urge to write is still so strong that she must do it. She has become increasingly aware that only she can write the stories in the particular way she does. – I always look forward to meditate. I feel much more composed. People tell me I’m more calm than I used to be. 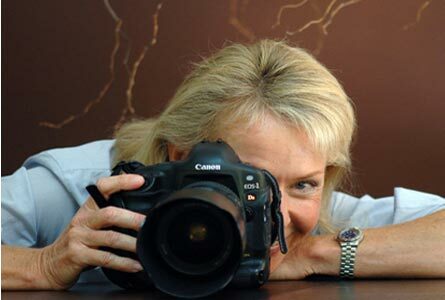 As a highly successful photographer, Caroline von Tuempling is not easy to reach on her home phone in Sussex. This week she may be working on a big production in Egypt. Next week you may find her with her camera in Bali. Or the Maldives. At one point she started to feel that her hectic life style was eating its way into her creativity. That’s when she decided to learn Acem Meditation. – I wanted to do something about my situation. My life is very busy, and I felt like I was chasing my tail all the time. I needed some time for myself. As a photographer I needed time to reflect to be able to be creative. So I learnt Acem Meditation.